1. Cut each panini into two horizontally and apply a generous layer of the spread on one side of panini. 2. Place a large lettuce leaf on one half of the panini. 3. Top 2 slices of feta cheese and some red pepper and pineapple slices. 4. Sprinkle salt and freshly ground pepper and sandwich with the top half of the panini. 5. Repeat with the remaining panini and ingredients to make 3 more sandwiches. 6. Apply butter on the outer surface of the sandwich and grill in a sandwich grill or a toaster till done. Pane means bread in Italian and panini means "little" bread (or buns). However, in America, panini means a certain kind of sandwich The bread is used is quite flat, a bit dense and a little oily. 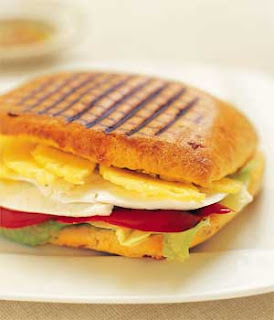 Now a days, panini bread is available at speciality baking shops in India too. If you do not find panini bread at your local baker, just use a regular burger bread instead.